My wife works downtown, and she just got notification of a bridge project on I-65 that will close the exits near the convention center. The project is scheduled to finish August 5th, so unless it finishes early it's going to affect anyone using 65 to commute to and from the convention, as the two exits closest to ICC will be closed. Here's a link to the INDOT page discussing it. Internet high five for the heads up!!! This probably won't directly affect con attendees unless they are coming down I65 or are staying on the north/northwest side of town. Indirectly, it will probably affect anyone driving to the con each day IF the bridges are still closed. Here's to hoping for a good summer construction season! Yeah. You'd have to be on I-65 coming down south to get affected by it, but it shouldn't screw anyone else. It stinks to lose the exit to West St., because that goes right by the ICC. It's such an easy route. But, well, that's construction season. If people were masochistic, I guess they could orbit around the west side on I-465, but man, that's a long way to go. Too long, in my opinion, but it might be less confusing for an out-of-towner. But there's no panic to be had here; there are ways in. This is an inconvenience for sure, but it's nothing more than that. And it won't even be that if the road crews meet their deadline. Late edit: If anyone traveling from outside Indianapolis reads this, I screwed up. You don't get on I-70 itself. I just looked at Google streetview to verify. When you're on I-65 heading south, there's already an exit for Michigan, Ohio, and Fletcher. It runs alongside I-70, but it's sort of it's own route. Just keep on following that exit until you get to the Ohio St. offramp. Of course, there are other ways in; I'm just correcting the one I suggested. Yeah, that mistake above is all mine. I don't live in Indy, I just have occasional business trips there. Pew...I was scared for a minute. I drive 65N to 70W and take the Madison Street Exit so this shouldn't affect our commute. Thanks the the heads up! It seems to me, there's always one of these roadworks happening right at the time of the convention. the Midwest has two seasons for roads. Winter and construction. You forgot early spring pothole season before the construction really starts up. This is going to mess up my work commute more then Gen Con for me. Just to clarify; they’re not just closing the on/offramps - they’re closing off I-65 in that stretch. If you’re coming from the north, you (and all traffic) will have to exit at 21st Street. Good news: On 21st Street, you can just go one block west to MLK Street, which will take you down to West Street and the ICC. 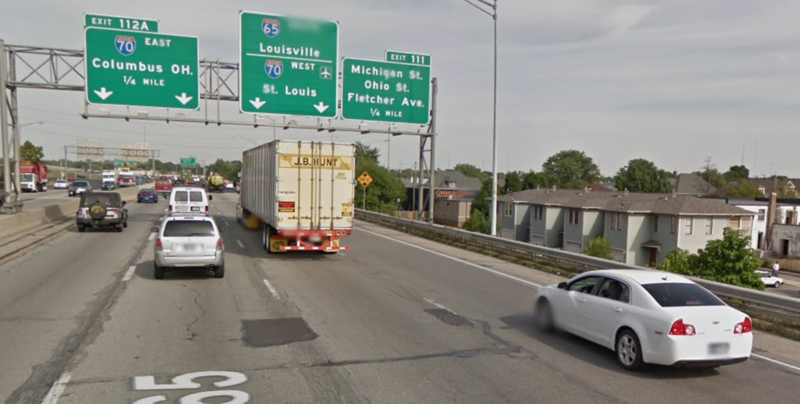 Bad news: with everyone having to exit I-65, the traffic through there could be ugly. Heck, for the past 3 or so years here in ohio, it seems even IN winter they are doing construction. That always irked me off, where they would REDO construction on the SAME stretch of road they did 2 years prior..
Heck, for the past 3 or so years here in ohio, it seems even IN winter they are doing construction.That always irked me off, where they would REDO construction on the SAME stretch of road they did 2 years prior..
As far as I can tell, there has been continuous construction on I-75 in Ohio since at least 1982, the first time I remember travelling through the state. Oy, I did misunderstand that. Yeah, you're right of course on all counts. 21st to MLK, which seems to just turn into West Street, is the easiest way to go. But the few times I've been on that road (admittedly just a handful... around 4 or 5), the traffic has already been bad enough. And those were just normal working weekdays. I can't imagine how bad "ugly" would be. But that's the weirdo in me. Doing that route runs the risk of being too confusing for someone who's not driven Indianapolis much outside of Gen Con. Still, though, either exploring and running the risk of getting lost, or putting up with stop and stop and stop and inch forward traffic on MLK & West St. would still probably be less time than orbiting 465 to get to I-70, then exiting to West Street within visual range of the stadium. That's a long trip. Maybe somebody would consider it just for the comfort in not getting lost on a surface street in the city, but still... I don't know if I'd recommend it.  garhkal wrote:Heck, for the past 3 or so years here in ohio, it seems even IN winter they are doing construction.That always irked me off, where they would REDO construction on the SAME stretch of road they did 2 years prior..
LOL, that reminds me of both the I-65 to I-80/94 exit as well as the Indiana Toll Road one up in northwest Indiana near Gary. An old job back in the 90s took me on that route regularly, and it seemed like the damn exits were always under construction. I joked that it was some sort of graft job project to keep reworking those areas over and over again. I don't think I ever recall a time when both did not have some sort of construction restriction. I'm on I-65 for nearly 95% of my trip to GenCon, but it's from Louisville. I was scared there for a minutes., Thanks for the info though, helps me plan routes for stuff around the ICC better. I am driving from Nebraska so I think I will be ok because I have GPS. Funny, I haven't seen any construction actually IN Indianapolis I was taking I-74 out west to visit a friend in Illinois. Out in the rural areas beyond Marion County, it seemed like every 2 miles I would see a sign that said "LEFT LANE CLOSED". We’re going Keystone Pkwy to 465E to I-70W to Meridian. There’s more to the top end of those directions, but that’s the important part. I think we’ll be in the clear, as we always avoid I-65 like the plague. Potholes galore and big trucks are not my jams. I used to come up I-65 from Lexington through Louisville, but I'm avoiding it now because of the new toll bridge in Louisville. It's only a couple miles difference to go via Cincinnati instead. I have to pick my brother up from the airport early Wednesday morning, so really I'll be coming in from that direction. "Several out-of-town drivers, unfamiliar with Indianapolis roads, said they were caught off-guard by the closures but quickly realized detours had already been programmed into their mobile map and GPS apps." That sounds good. But even without GPS, it shouldn't be hard to get to the convention center. After all, I-65 Southbound traffic will be required to exit at 21st street, like discussed above. One right turn off that exit, then one left turn onto MLK Drive, and MLK basically turns into West Street which then runs right between the ICC and Victory Field (the minor league baseball stadium). It shouldn't be difficult to navigate, but it might be backed up to hell and gone by August. Still, though, stop-and-go traffic would be a pain, but at least you wouldn't be getting lost. This is all for drivers coming down from the north side of Indianapolis. Anyone taking I-65 up from the south side shouldn't have any worries; the closed section ends well before any exits you all would be taking. I didn't notice a difference driving in to work today. Of course, I come in from the south side and I leave pretty early.